Mike MacCarthy is self-publishing a book with Outskirts Press, and he wants your help deciding his book cover. The year is 1429 and the English have been attempting to annex France since long before Joan can remember, and since 1419 trying to illegitimize its crown prince (the Dauphin). Joan, 17 years old and a pious young woman, runs away from home in order to attempt an impossible mission from God—have herself appointed as a French field general and lead her country to victory over the English. She knows she’s small in stature, of low birth, illiterate, and has no knowledge of war or politics. Nonetheless, like her hero, the Blessed Virgin Mary, she says “yes” to God and, determined to succeed, sets off to prevent a major English victory at Orléans. Like Michael and Jeff Shaara’s historical fiction models, this book chronicles Joan’s every perilous step from the harsh road away from her parent’s farm to the Dauphin’s heavy-handed investigation to determine if she’s a witch or virgin. It also portrays the indignity she suffers at the royal court as well as the anger and hysteria among veteran French generals with the announcement of her elevation to knighthood. 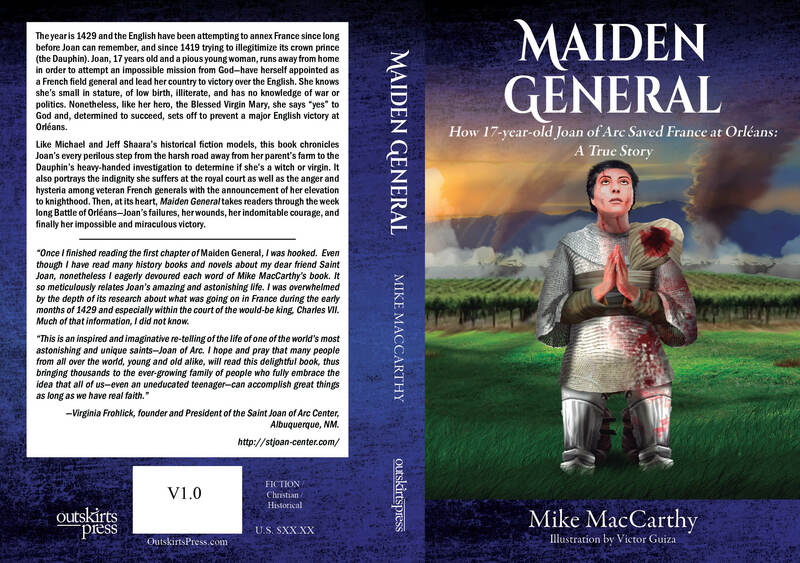 Then, at its heart, Maiden General takes readers through the week long Battle of Orléans—Joan’s failures, her wounds, her indomitable courage, and finally her impossible and miraculous victory. 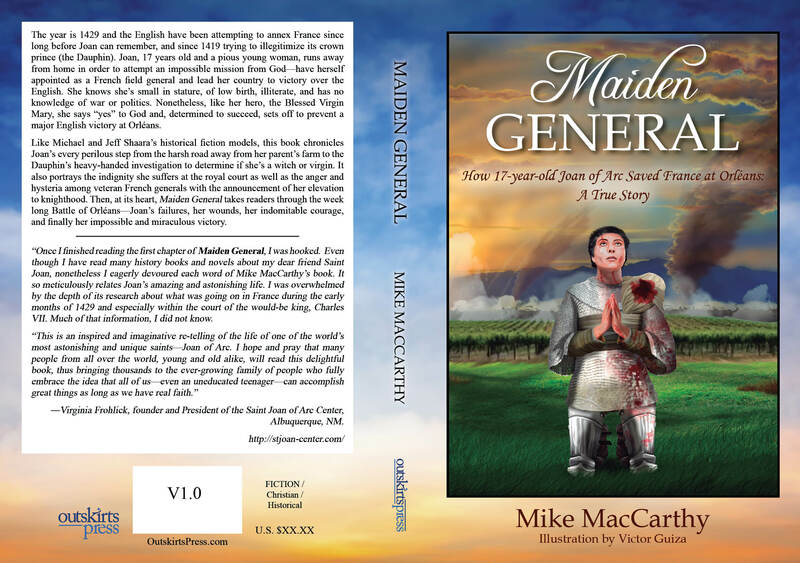 “Once I finished reading the first chapter of Maiden General, I was hooked. Even though I have read many history books and novels about my dear friend Saint Joan, nonetheless I eagerly devoured each word of Mike MacCarthy’s book. It so meticulously relates Joan’s amazing and astonishing life. I was overwhelmed by the depth of its research about what was going on in France during the early months of 1429 and especially within the court of the would-be king, Charles VII. Much of that information, I did not know. ―Virginia Frohlick, founder and President of the Saint Joan of Arc Center, Albuquerque, NM. In 1990, Mike MacCarthy co-founded San Diego Writers Monthly, which led to his collaboration on 11 published books. He fell in love with Joan of Arc in the hospital at age nine and has since spent so much time reading, writing, and speaking about her that his wife of 34 years lovingly calls Joan “the other woman” in his life. Please take a look at the two possible covers below and then vote on the choice you recommend for Mike. Next Next post: Congratulations to the 2015 Outskirts Press EVVY Award Winners!